27-Aug-2005 -- It has been more than three years since my last South Korean confluence visit. I had completed visiting all 10 of the ground confluences here, so I had considered the mission largely complete. But about a year later the country page would list 13 additional water confluences that were classified as 'in the view of the land' and thus added to the primary confluences. Since then there were two foreigner-led attempts to visit these water confluences (one near Mokpo and one near Incheon), all without success. While recreating my website I remembered these forgotten visits I made, added the link to confluence.org, and vowed to pick up where I left off. I had two points in mind: 37N 126E, and this one - 35N 129E. The 37N 126E one is one of the confluences that are relatively near Seoul and I was originally planning to go there first. However, I was going down to Ulsan to visit my family over the weekend and this brought me fairly close to 35N 129E which is right off the coast of Busan, the city just south of Ulsan. So I made change of plans and decided to try my luck at this one instead. Okay, I'll ramble about the details of the trip itself in the blog, and fast forward to the actual confluence. In a nutshell, the first successful visit to a water confluence on South Korea has been made. The transport vessel altered the course slightly to place itself right over the confluence and stopped there. The ship's GPS system told us that we were properly over the confluence so I went out to the deck to take the pictures. Looking over to the north we could see the Dadaepo area of Busan, which is famous for the beach (closed for the season last week). I took a closeup and could see the dense apartment complexes which were built last decade as a part of the municipal development project. 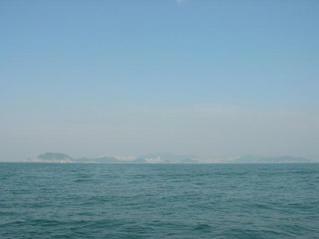 To the south, an isle called Namuseom (or Mokdo, if you prefer to call it in Chinese letter form) was readily visible. This was one of the intended destinations of the boat and was about a kilometer away. It's one of the favourite spots for fishermen. There was no land visible to either east or west of the confluence. I have to thank at least two people for the success. Young-Man Chung, my dad, who made this degree confluence visit as a family trip and brought the whole family to Busan. Also, Hae-Yun Choi, the captain of the transport vessel Daeheung, who went through the trouble of altering the regular course of the ship, which transports fishermen in and out of the nearby isles, just so we could visit the degree confluence. In the water, but with a view of land.